Learn about memory leaks, how to find and stop them, and how this impacts speed and performance. You don’t even have to imagine, just look around. The renting and subletting is similar to memory allocation. The builders and contractors raise a building and sell or rent the apartments to people in need. The owners, in turn, live in them or rent/sublet them further for profit. When I was 8 years old, there was a house that had been vacant forever. I would shiver at the thought of entering that ruin, that is what a memory leak is. "What is Garbage Collected language?" you ask. Basically, it helps you keep track of the previously allocated memory and help you keep the leakage to the minimum and it does that by the simple yet effective algorithm that is called as ‘Mark and Sweep’. Imagine a network of memory blocks interconnected, now you go to the root and mark all the reachable(referenced) blocks from the root. When it is done, you have all the memory that is allocated to your script. Now the rest of the blocks, which can’t be reached, must not be in use by your script. So they are swept away to the OS and put in the free memory pool. The algorithm seems almost perfect, but there are still many ways that leakage still can happen. Browsers like chrome provide a variety of solutions to the memory crisis by providing specialized tools to the developers. Using Chrome task manager, you can easily manage and keep track of the heap memory(allocated to JS) as well as DOM nodes. It informs you about how much memory the page is using in totality. If the Memory is increasing that means more and more DOM nodes are getting created. Visualize your memory leaks using the timeline recording feature and even record your data for further comparison of before and after the garbage collection. Heap snapshot is very effective in knowing the DOM nodes creation and keeping in check the leakages due to the faulty scripts. In the end, we all want web pages to load faster, to work and perform efficiently without putting pressure on your system. To enable that we should follow good practices and follow efficient scripting. 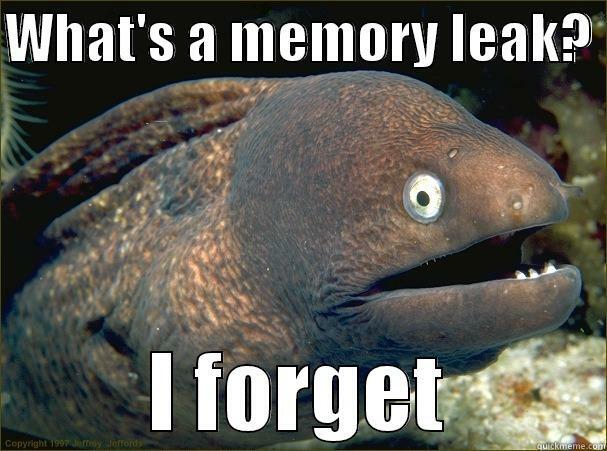 In the next few blogs, we will discuss what causes memory leakage and how we can eradicate this problem.